Post construction or renovation cleaning services are extremely important to ensure that the construction crew has completed their project, and make the area clean and safe for human dwelling. This kind of cleaning, whether for a residential or commercial building, should be performed by a professional commercial cleaning company that has the necessary expertise and experience to do the work according to set standards. 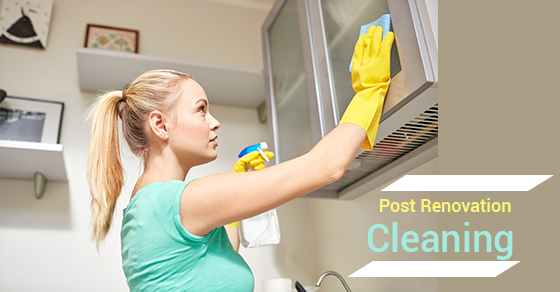 Why Is Post Renovation Cleanup Important? •Keep the ducts clean – even when the contractors do their best work, it is inevitable that some dust and debris will still make its way into the building ductwork. This can pose serious problems for individuals who are sensitive to dust or suffer from respiratory ailments. Clogged ducts can also increase your energy bill. •Reduce subsequent cleaning costs – dust and debris in the construction zone should be collected before anyone begins to occupy or use that space. Thorough cleaning is usually done in only day without fear that anyone present will be disturbed by the commotion. Failure to remove the dust means that you will be constantly cleaning construction dust after you have occupied the building. •Cleaning the windows – clean windows are important to let in natural light, provide a clear view of the outside for employee morale, and make the environment inviting for clients and customers. •Cleaning the cabinets and drawers – all closets, drawers, and cabinets should be thoroughly cleaned before filling them with items, to ensure that the environment does not degrade or interfere with the quality of those items. •Ensure that all areas are usable – it is important that all areas of your home or building be in usable state when you move in, to make the entry process much easier. For instance, the kitchen must be clean before you can arrange the appliances, and the bathroom fixtures must be clean before they can be used. •Ensure safety – besides sensitivities to dust, debris or grit on the floors can pose danger, especially when children are involved. Considering the importance of post renovation cleaning, it is important that you work with a professional company that not only understands the best way to clean your space, but also uses safe, non-toxic, and environmental-friendly cleaning materials and techniques. For more information, talk to the team at Sunrise-Cleaning today!